Armidale Dumaresq Council recognized that they needed to lead by example in their own workplace operations if they were to fully support their Community Strategic Plan. 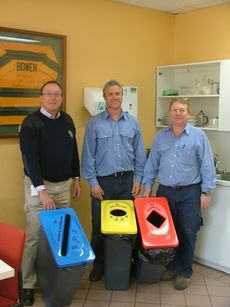 An initiative was rolled out in the main Civic Administration Building, the library, and two main community centres of the CBD, targeting cardboard, office paper and plastics recycling, and introducing collections for composting paper hand towels and food scraps. "Ultimately we would like to fully eliminate the skip bin collection," says Carol Davies, Council's Sustainability Coordinator. "And we hope to build a business case about these initiatives to transparently transfer cost savings into other environmental initiatives and promote the benefits to other organisations." The initiative involved creating ‘bin clusters' to replace individual desk bin collection. Internal communication about the delivery of the program was vital in rolling out the program. Stories were published in the staff newsletter about the roll-out and signage was vital part of its success. "Now it's just ‘normal'," says Davies. "Since the program's inception, we have eliminated desktop bins and reduced our skip bin collection. We are diverting approximately 70% of waste from landfill through recycling and estimate a cumulative saving of around $7,000 per annum."